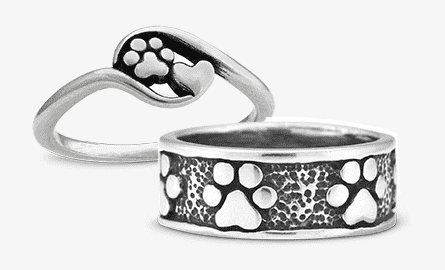 Dazzling Paws Jewelry - Handcrafted fine jewelry for people who love dogs! 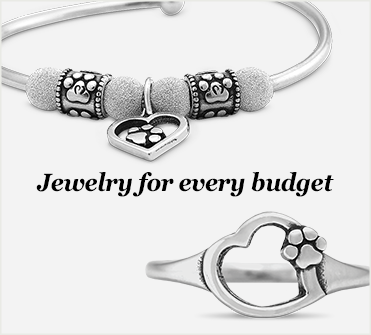 Dazzling Paws Jewelry reflects the unconditional love you receive from your dog, capturing that emotion and channeling it into one-of- a-kind dog jewelry in every price range, to fit your budget. The Dazzling Paws Jewelry line delivers passion for dog themed jewelry in Sterling Silver paw print jewelry and dog bone jewelry, authentic dog breed designs many with added unique artistic flair, heart paw jewelry, a semi-precious stone assortment, our customizable Letter Line, birthstones, rings, and precious pet memorial keepsakes. 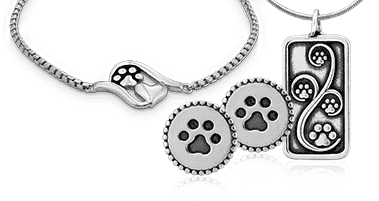 The Dazzling Paws Jewelry collection is 100% handcrafted in the USA from Recycled Sterling Silver. 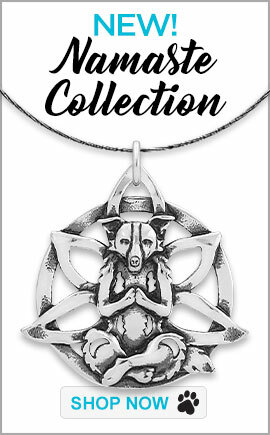 Dazzling Paws Jewelry debuts over fifty new, unique pet themed jewelry designs each year. We are dedicated to the art of creating distinguished, fashion forward paw print jewelry, dog bone jewelry, and heart dog jewelry like no one else can deliver. 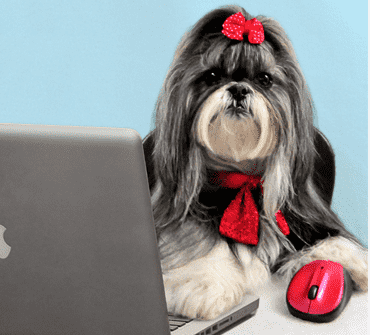 Whether celebrating with pet jewelry for yourself or buying as a dog lover's gift, you will be impressed with our quality, excited by our selection and happy to find pet themed jewelry. We strive to earn your trust and confidence through our excellent customer service. At Dazzling Paws Jewelry, our goal is for you to feel truly beautiful wearing our American handcrafted Sterling Silver jewelry! We love dogs so we take extra time learning the qualities that are most important and unique for each breed! 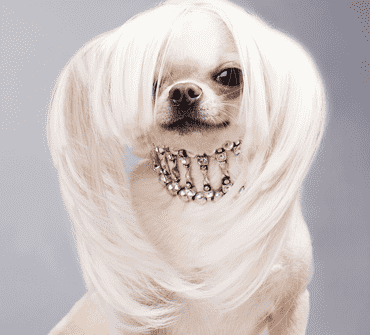 Our dog breed jewelry reflects that care and painstaking attention to detail. 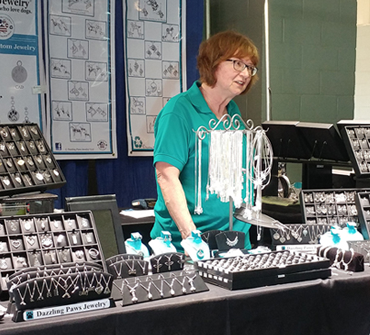 Dazzling Paws Jewelry creates authentic dog breed jewelry with an added distinction of artistic flair. 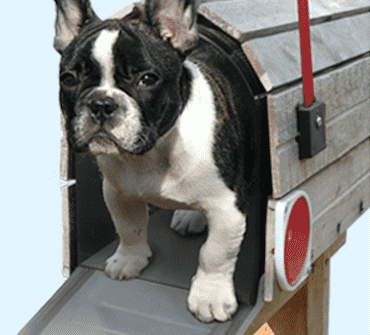 This concept is an innovative, fresh approach that captures the true essence of a dog breed's appeal. Most of our breed designs incorporate a symbol that represents what the dog is bred for or a significant item that identifies a connection to the breed. Our dog breed jewelry is crafted to connect dog breed lovers to the breeds that have won their hearts. View our cutting- edge breed designs like; Beagle-eared bunny, Labrador Retriever with ducks, adventurous Portuguese Water Dog with jumping fish, the Jack Russell -n- sly fox, Bernese Mountain Dog and vintage drafting cart, beautiful Papillon with subtle butterfly, elegant English Springer Spaniel with pheasant, iconic Alaskan Malamute with sled... these are one-of- a-kind wearable art treasures with pizzazz and standout style to express your dog breed pride! 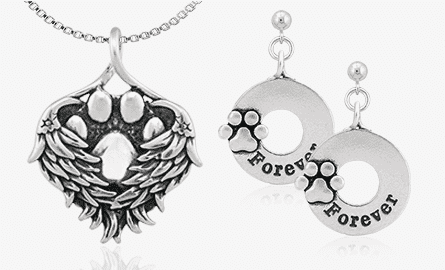 Wholesalers: Dazzling Paws Jewelry is unique in the pet industry, jewelry industry and the wholesale dog jewelry industry for our expanded line of Sterling Silver jewelry created specifically for pet lovers. We welcome inquiries for new distributors to carry our jewelry lines. Dazzling Paws Jewelry maintains the highest quality standards to ensure customer excellence. The benefits of carrying our distinguished, identity lines are many. 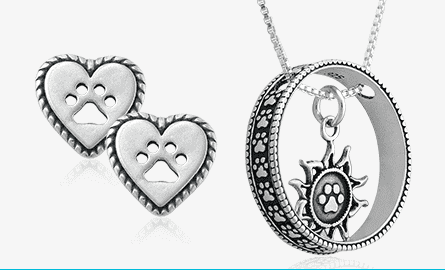 Customers know our pet theme jewelry brand which can drive traffic and add value to your product mix. Sterling Silver is an affordable luxury; blend that with people's passion for their canine companions for a winning top dog formula! 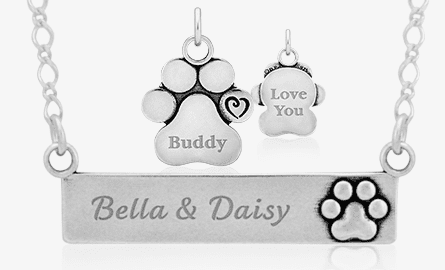 All our wholesale paw print, wholesale dog bone, wholesale pet memorial, and wholesale dog breed jewelry is carefully crafted and made in the USA which is a source of patriotic and economic pride.